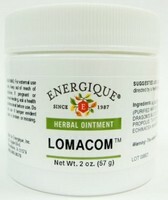 Lomacom is a topical herbal ointment that fortifies the skin. It has been used in cases of anti-viral, anti-fungal, anti-bacterial and anti-microbial situations. It also aids in the treatment of dry, cracked skin. Lomatium (root), Pau D'Arco (bark), Propolis, Sangre de Grado (bark), Tayuya (root), Usnea (whole plant), Organic Echinacea (root), Myrrh (resin).